In June 2018, Kurà Design Villas joined Virtuoso, becoming the first designer boutique hotel within Costa Rica to join the Virtuoso Consortium. We know that your Virtuoso travelers will love the adults-only experience on this property, but the location in Uvita always elicits questions. Specifically, why would I go to Uvita (and where is it) and what is there to do at Kurà? Following are just 10 of the reasons to choose Kurà Design Villas for your clients. Kurà is situated above Uvita on Costa Rica's Southern Pacific Coast, overlooking Marino Ballena National Park below. When the tide retreats, a huge sand bar in the shape of a whale's tail is revealed. Fittingly, this waters surrounding the whale's tail offer some of the best Humpback whale watching on the planet. People always think of Alaska, Baja and Antarctica when it comes to whales, but Costa Rica and Marino Ballena National Park in particular offers the longest Humpback whale watching season in the world. For 8 months out of the year, both Southern hemisphere humpbacks traveling from Antarctica and Northern hemisphere humpbacks traveling from Alaska frequent this segment of Costa Rica's Pacific coast where they mate, give birth and raise their calves. The best time to visit for whale-watching is mid-July to October and December to March. Dolphins, orcas and sea turtles are also visible here year round. Costa Rica has a plethora of hotels with ocean views and beautiful rooms, but there is nothing like Kurà. The passion project of biologist Alejandra Umaña and architect Martin Wells, both Costa Rican, Kurà is a locally owned property that was crafted from local and sustainable materials and operates with minimal environmental impact. Design elements are modern and minimalist (instead of cluttered and palm thatched) and immerse guests the nature surrounding them through the floor to ceiling glass walls. The hotel operates almost entirely "off the grid"; solar panels provide electricity and heat, water is sourced from a nearby spring (and then recycled for garden needs) and a greenhouse supplies produce and herbs for the kitchen. For those who want to sample the wild & pristine rainforests of the Osa Peninsula & Corcovado National Park by day, but return to a world of pampering and creature comforts at night, Kurà is for you. The Osa Peninsula has been hailed as one of the "most biologically intense place on the planet" by National Geographic, and accounts for an astounding 2.5% of the world’s biodiversity in just 0.001% of its surface area. Guests at Kurà can either travel by boat (1.5 hours) as part of a small group to the San Pedrillo Ranger station for a day of hiking along an array of the Corcovado's trails or charter a small plane or helicopter to explore the park with a private guide. 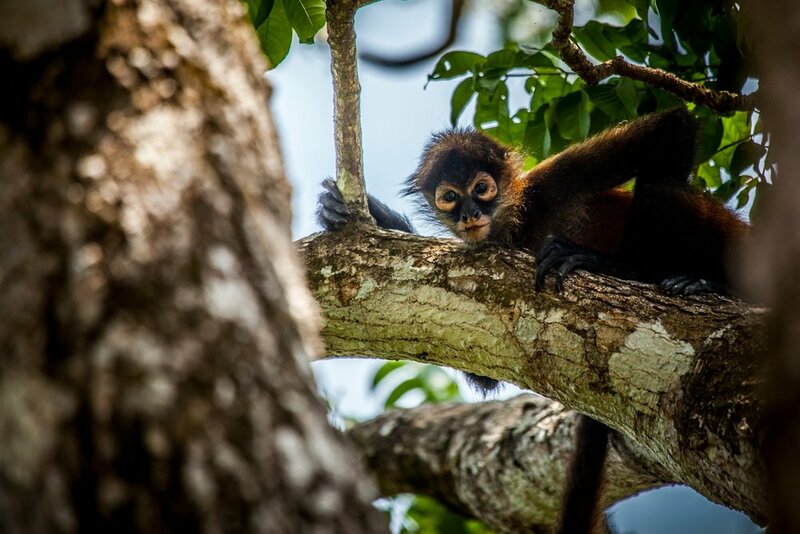 Either way you're sure to see some of Corcovado's legendary wildlife - macaws, sloths, tapirs, all four species of monkey and more! Where else can you perch on submerged benches to gather around a "bonfire" that is floating on top of the water, listen to your favorite tunes while you swim laps underwater or lose track of the separation between the ocean and the sky? Kurà's infinity pool (chemical free and designed by Wells) is both out of this world and totally instagrammable. Does anyone actually hang out like this? From salsa dancing siblings (three siblings from the Leiva family) to sweet Lalo who carefully shuttles guests between Kurà and the beaches of Uvita, Kurà employs nearly 40 staff directly from the local community. They are a tight knit group, and when you stay at Kurà, you're part of the family. Expect friendly and anticipatory service, strong and delicious drinks delivered poolside, insight into Costa Rican customs and indigenous culture and plenty of sincere pura vidas! You'll may initially go for Kurà's views and style but you'll return for the staff. While Kurà isn't a beachfront property, they do offer daily complimentary shuttle service to the wild and un-manicured beaches of Marino Ballena National Park. Rent a board in Uvita and surf the easier beach breaks, walk out to the tip of the Whale's Tail formation at low tide or scan the ocean for surfacing cetaceans. Just don't expect lounge chairs and beach service - this is a National Park and feels more like the set for 'Castaway' than a Sandals resort. 9.) Because you Can Go Birding From Bed. Or practice your Spanish. Learn about the native Boruca indigenous group, carvers of the gigantic wooden masks that adorn Kurà's walls and Diablitos Bar. Try your hand at preparing ceviche, craft cocktails and patacones. Take a yoga class. Or relax and enjoy a deep tissue massage at Spa Shà...all without leaving Kurà. And if you do want to head out and explore your surroundings, the staff is happy to arrange a multitude of vetted excursions with local guides. Check out the Tour Book to learn more about what is available in the area. Discover the canopy and its winged occupants right outside your bedroom with bedside field guides and high quality binoculars. To include Kurà in your clients' next trip to Costa Rica, work with the hotel directly at reservations@kuracostarica.com or contact your preferred On-Site or Tour Operator and let them know that you are a Virtuoso agent.